Sugarcane + Coconut + Lime. Or 'Cococane', as some people called it. On its own, the ingredients in this drink are naturally cooling; when you combine them together, it made for a refreshing drink. 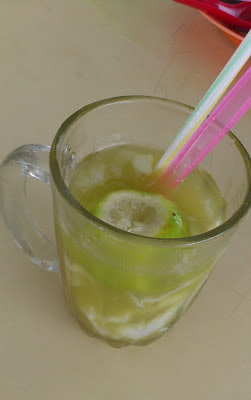 I had this drink in Kuching on my last visit to the city. We had a late lunch at the Song Kheng Hai Ground Food and Recreational Center (it's a mouthful name for a place) at Padungan. The weather has been extremely hot in KL in these few days and I wish I could have this cooling drink. But I have yet to see anyone selling it. Seem like this drink is only found in Kuching.